A gentle reminder to use your talents even if you don't think they are the very best. Hoping you are feeling blessed and thankful. A winter wonderland at the manor. 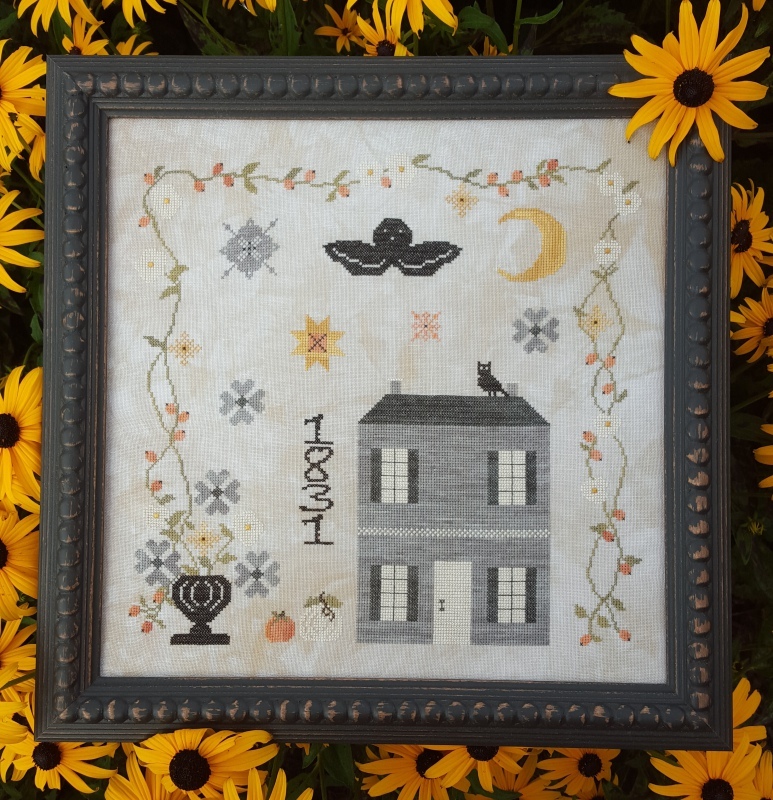 This needle book is based off “With Needle and Thread” sampler. Colors changed up a bit but could easily be done in the colors of the original sampler. 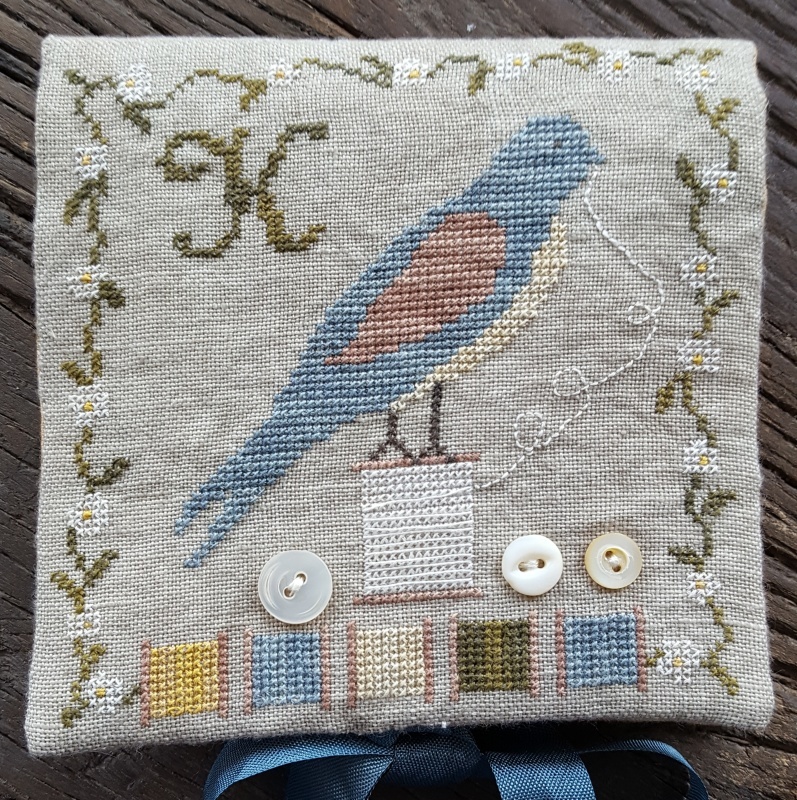 A quick little stitch….I love the muted colors. 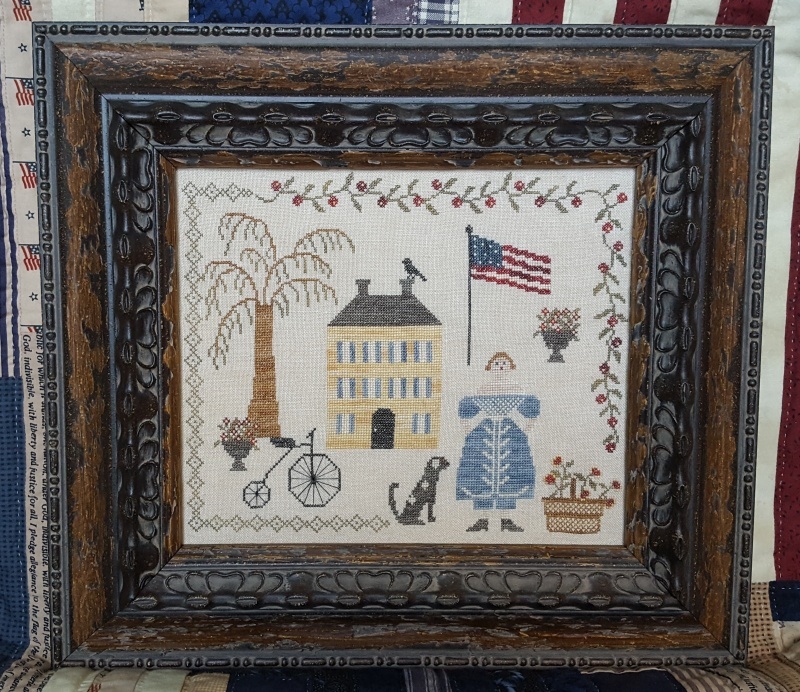 Love the saturated colors in this piece…it looks so royal to me! 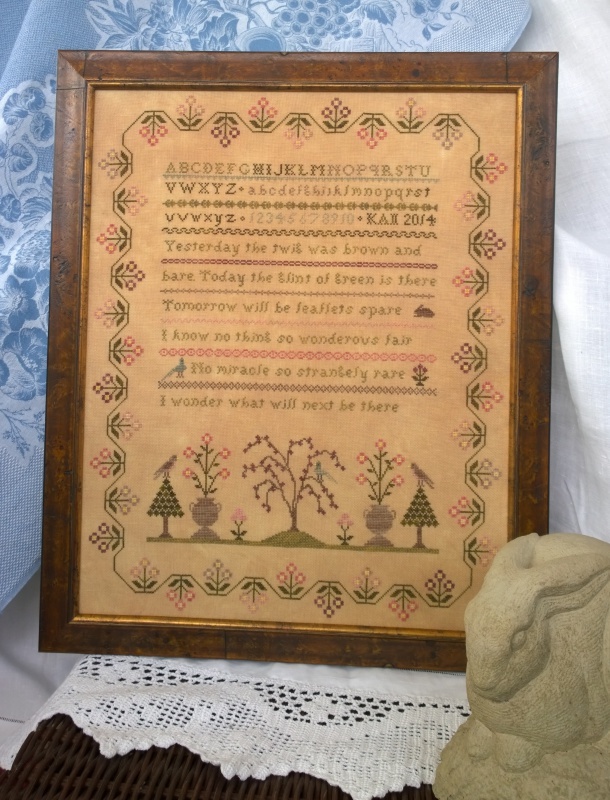 This sampler can either be done in mainly cross stitch (there are a couple of stitches in the alphabet but even those could be done in cross stitch) or have fun playing and fill in with Stem Stitch. 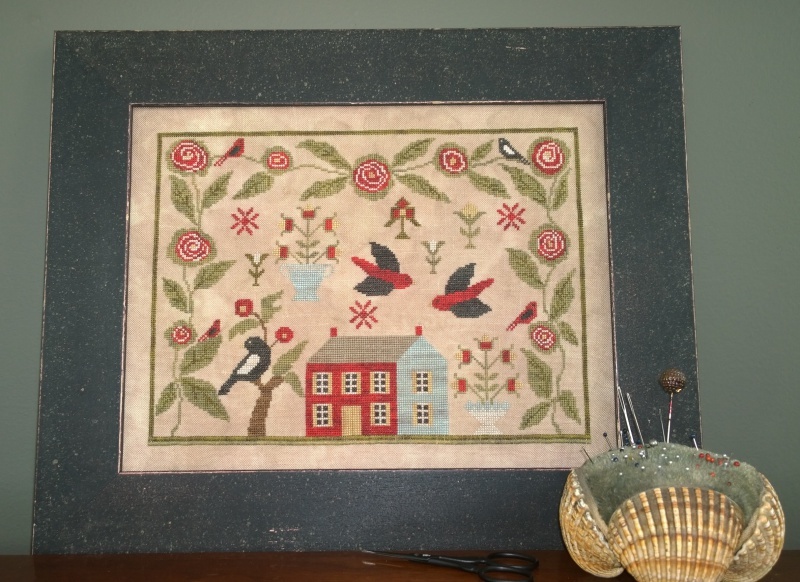 I love the look of Stem Stitch, it is kind of like painting with thread. "Lord what is life...tis like a flower that blossoms and is gone…we see it flourish for an hour…with all it’s beauty on…but death comes like a winter day, and cuts the pretty flower away." We didn’t have the red truck (which I think would be really cool) but we did go cut down our Christmas trees every year when I was a child. Up and down the hills, freezing, until you found the perfect tree (which usually ended up having to be tied to the wall!). 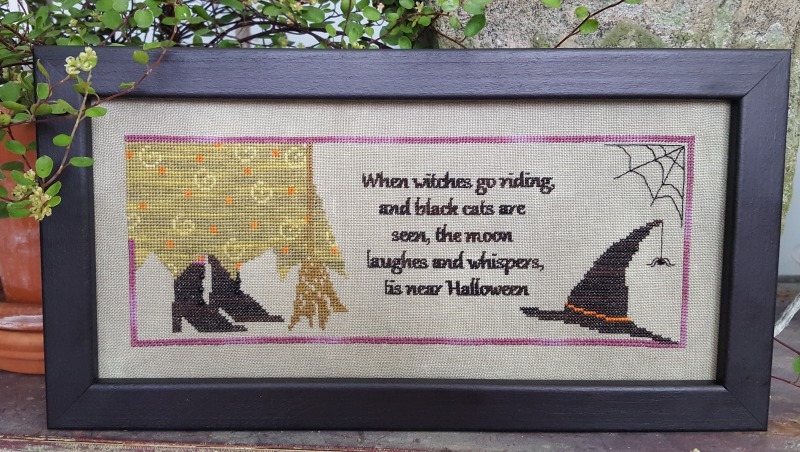 A quick fun stitch for Halloween. 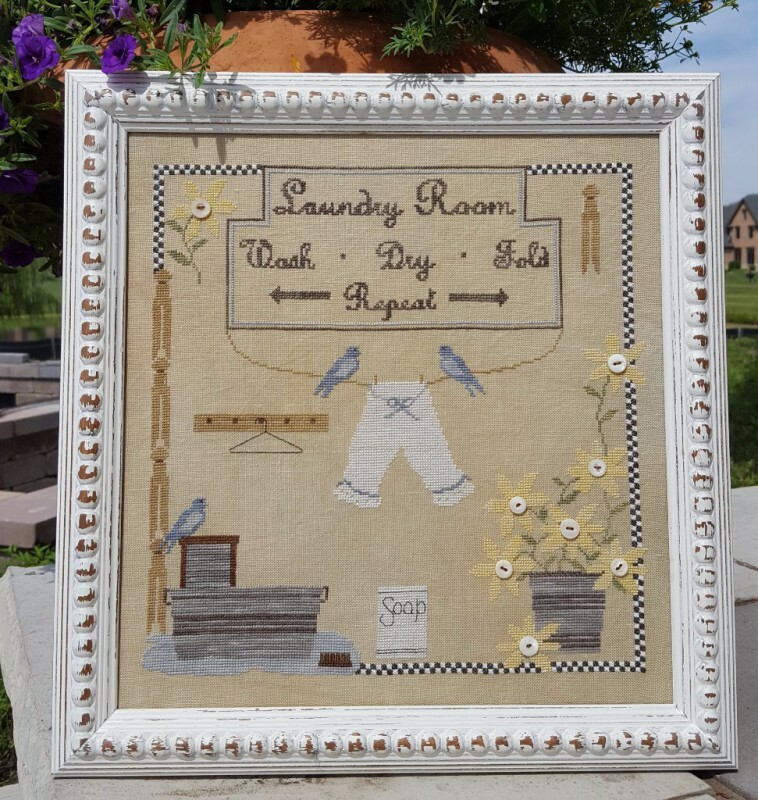 Not sure how much time you spend in your laundry room... 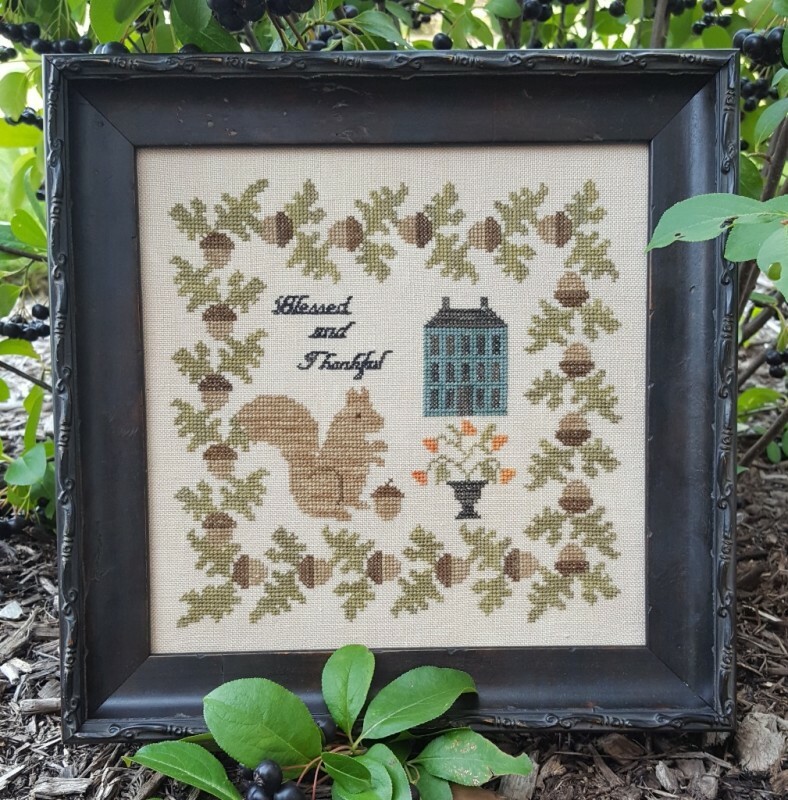 I felt the need to make it a place to enjoy spending time in. 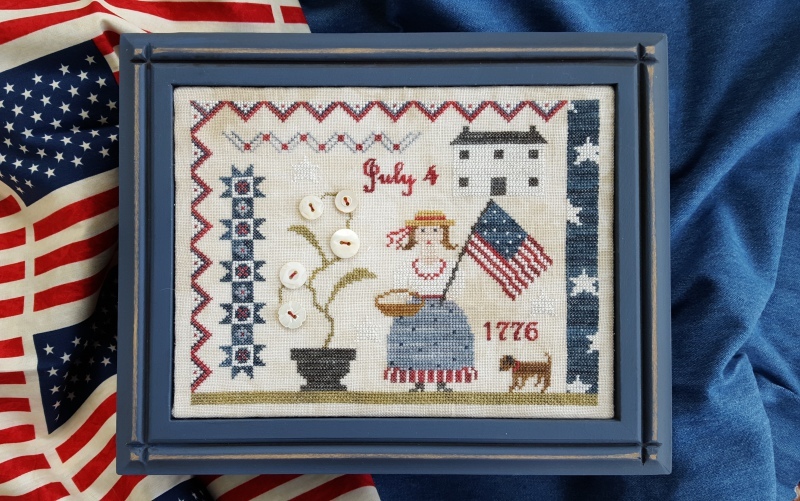 A fun little patriotic piece to grace your home for the summer. 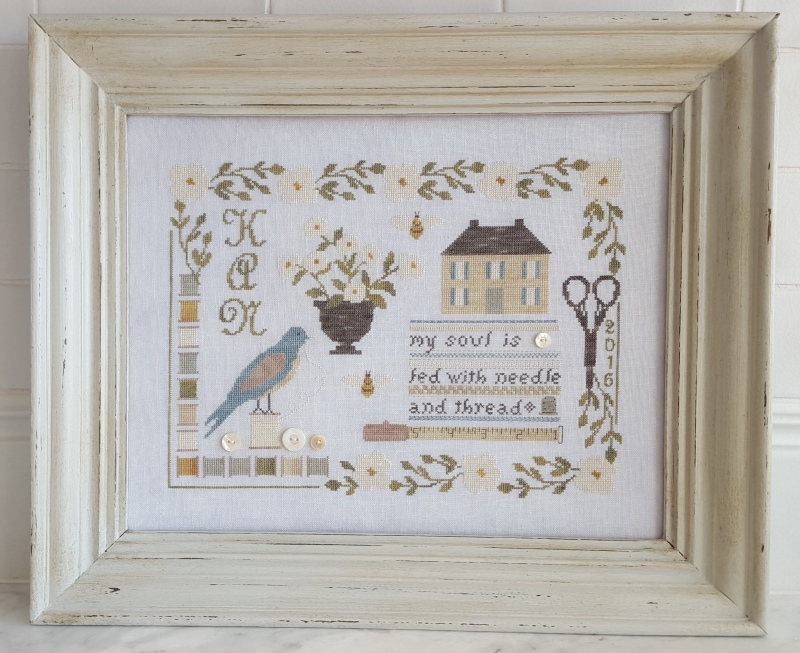 "my soul is fed with needle and thread"
Not sure about you but for me this saying is so true. 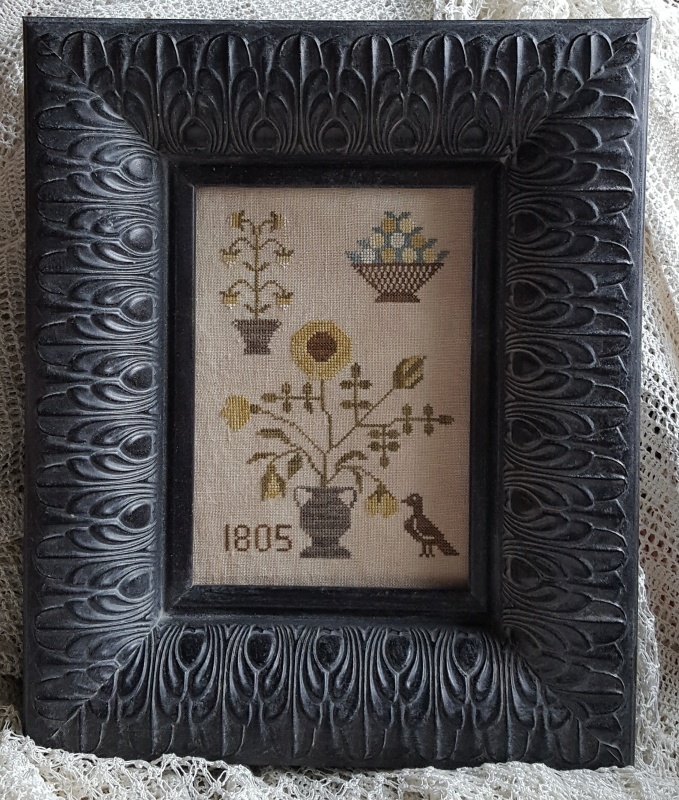 This piece was inspired after a day out at an antique show with a new friend who has the same love of samplers I do. 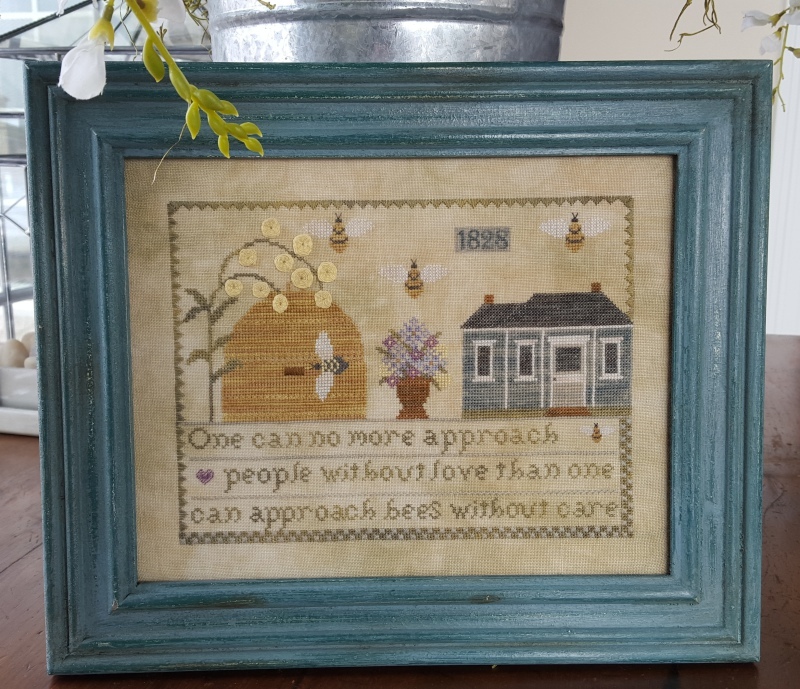 This piece is charted for cross stitch but instructions for a variety of stitches are included to stitch the bee skep and flowers. 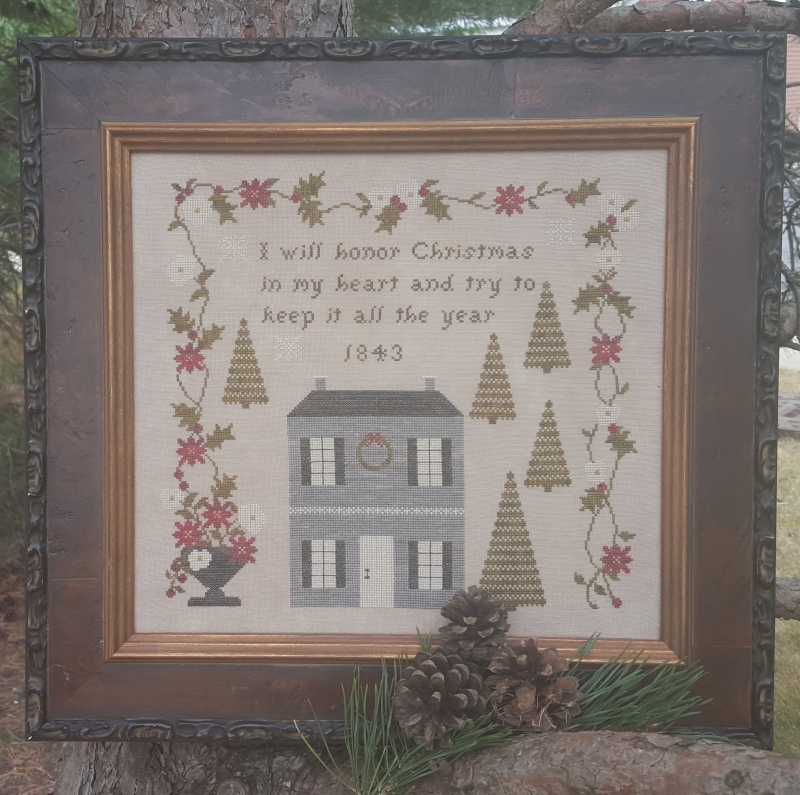 "I will honor Christmas in my heart and try to keep it all the year" is a quote from the Christmas Carol written in 1843 by Charles Dickens (1812-1870). 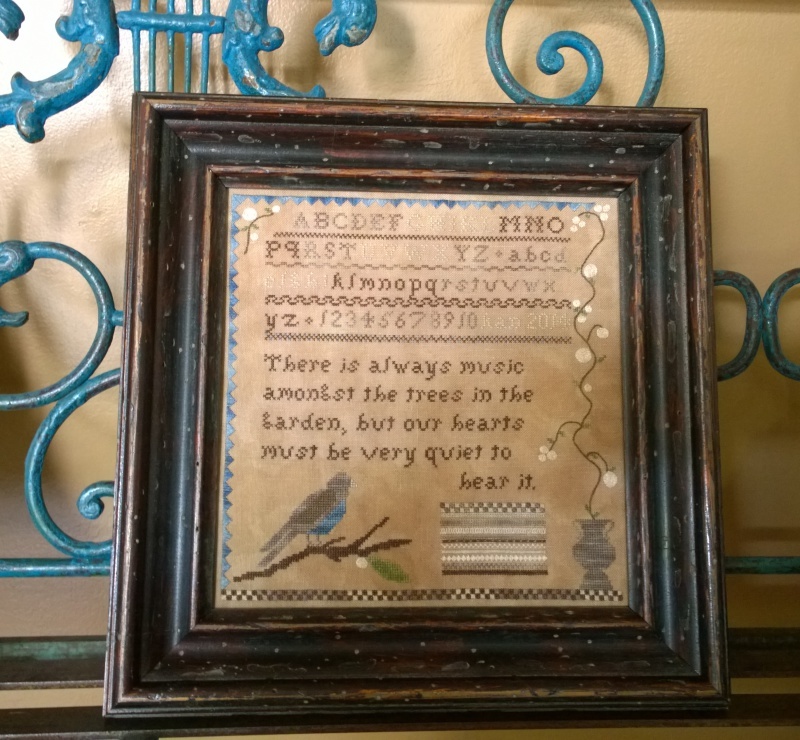 A favorite saying and one that I try to keep in my heart year round. 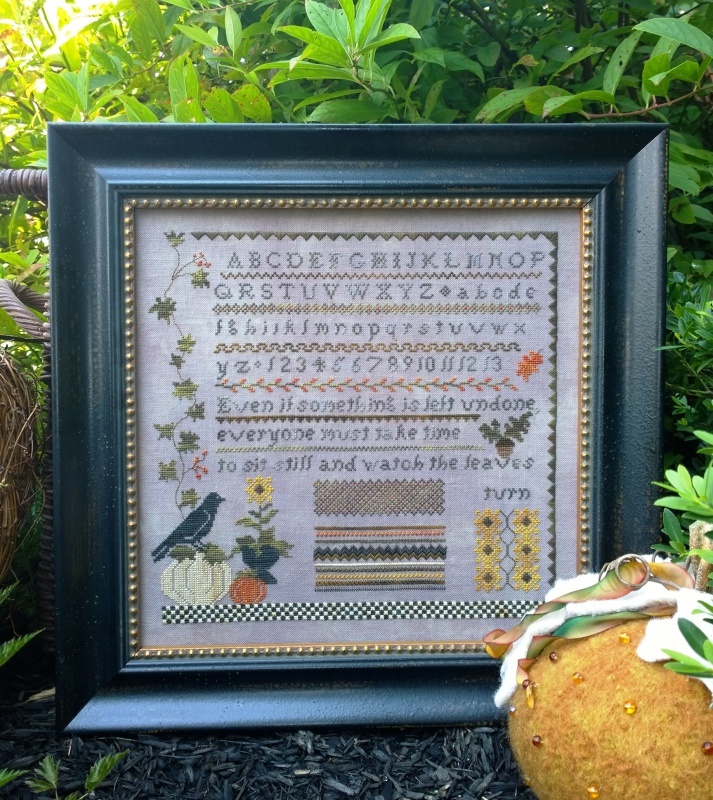 A charming Autumn sampler done for a friend who doesn't like to go too Halloweeny! "If I had a flower for every time I thought of you... 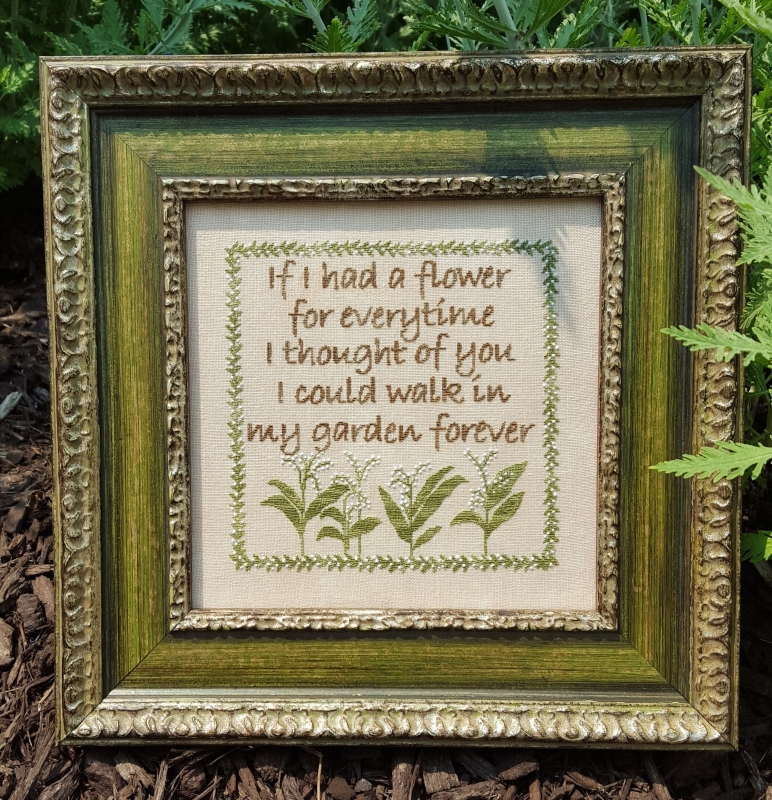 I could walk in my garden forever." 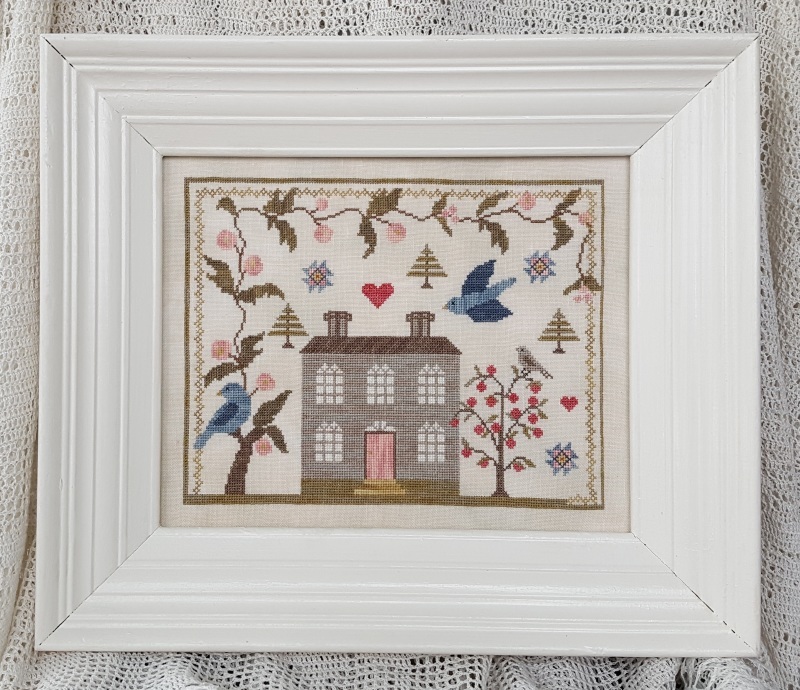 A sweet little sampler to stitch for yourself, a friend, or a loved one. 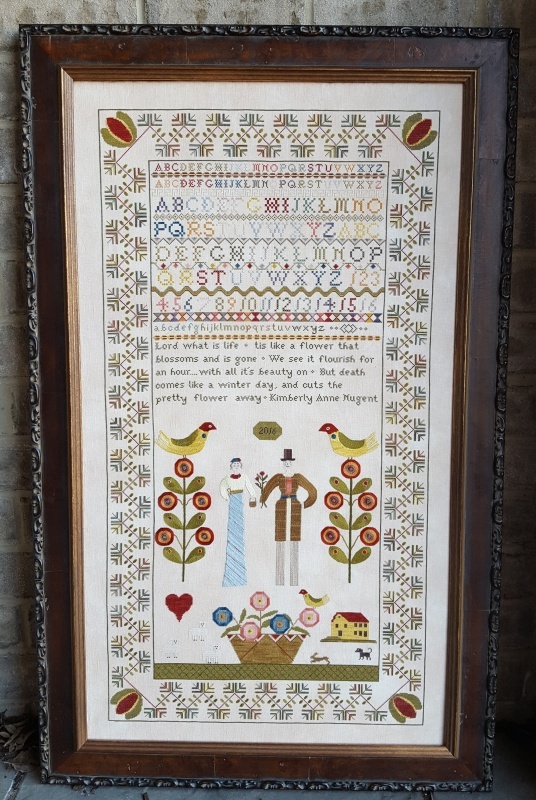 A fun whimsical sampler done in bold colors. 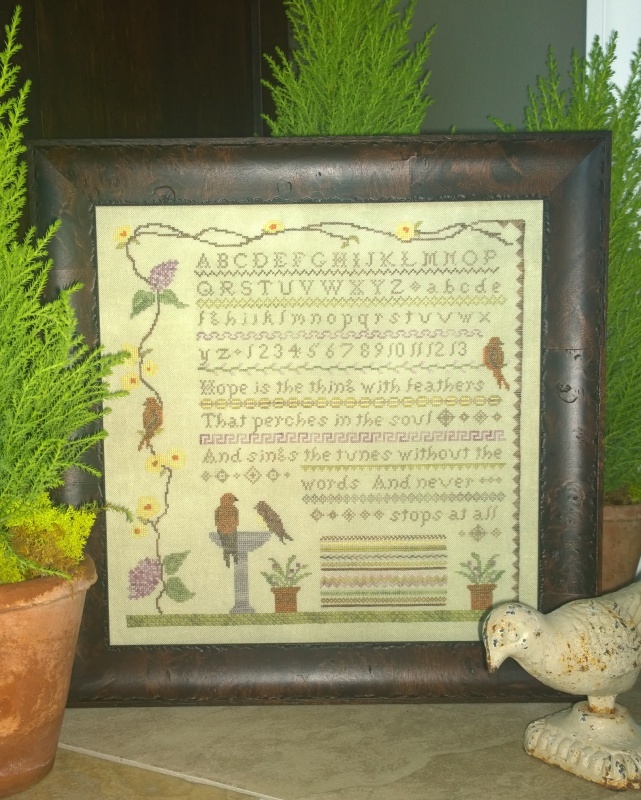 The majority of the sampler is done in cross stitch with the option of doing the Padded Satin Stitch on the birds wings. 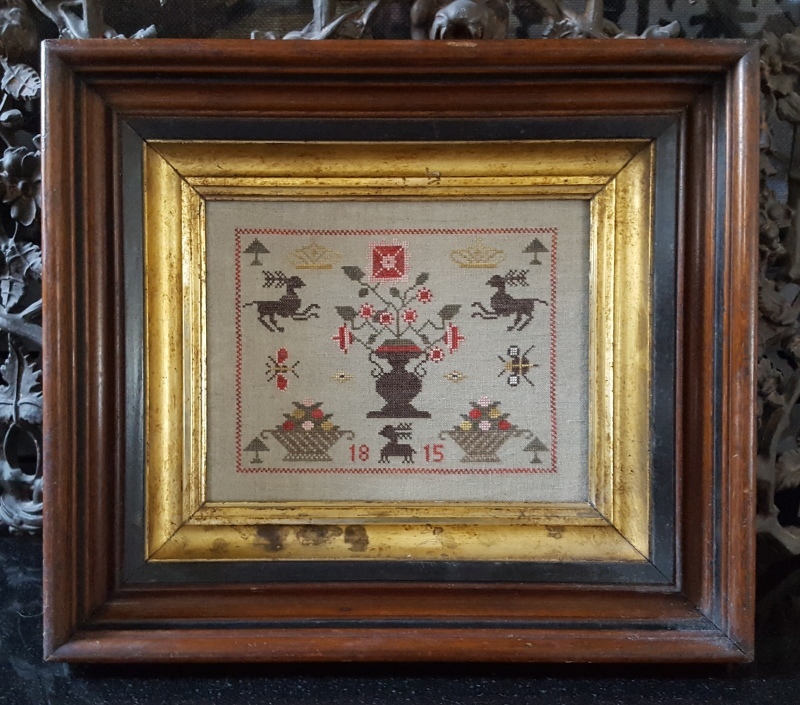 Fourth in the series of samplers with lots of fun stitches. 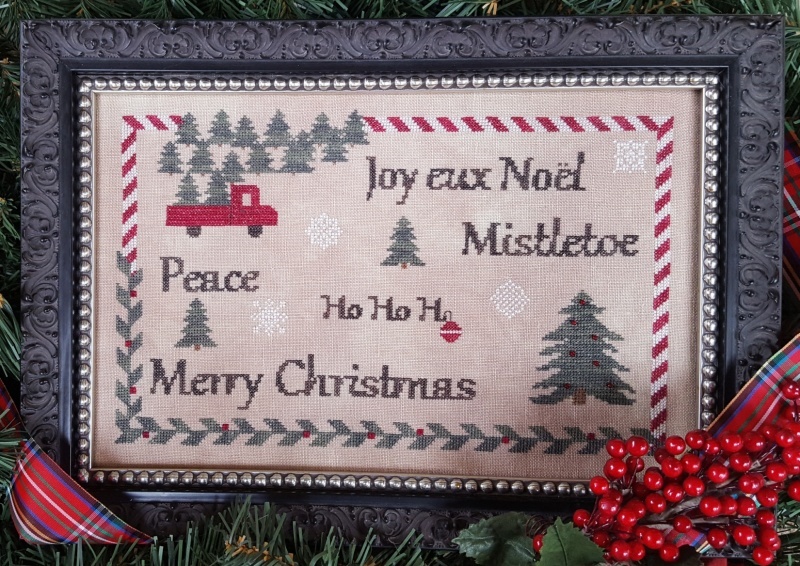 The verse on this sampler is from "O Christmas Tree" a German Christmas song written in 1824 by Ernst Anschutz. 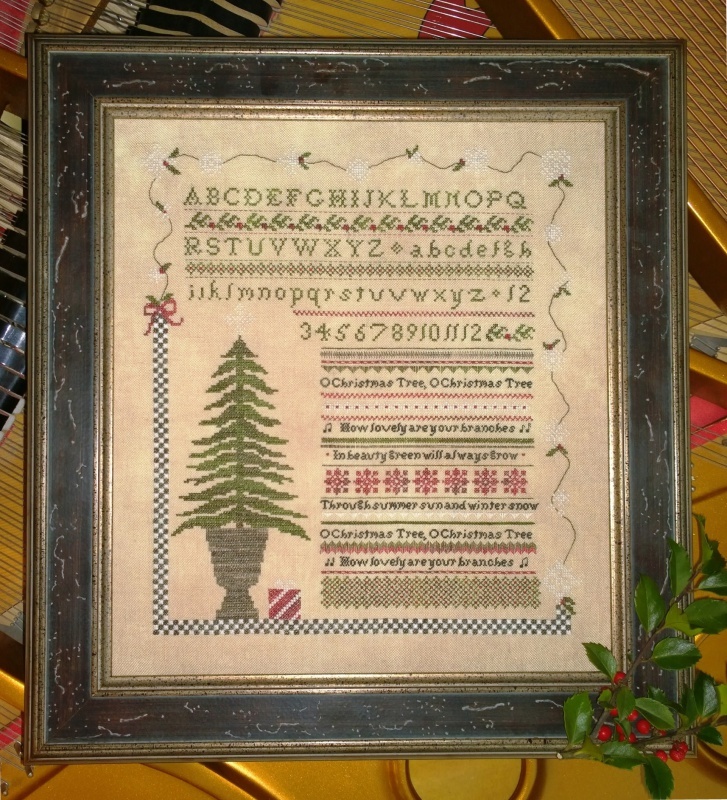 This song was based off a 16th century Silesian Folksong by Melchior Franck called Ach Tannenbaum. 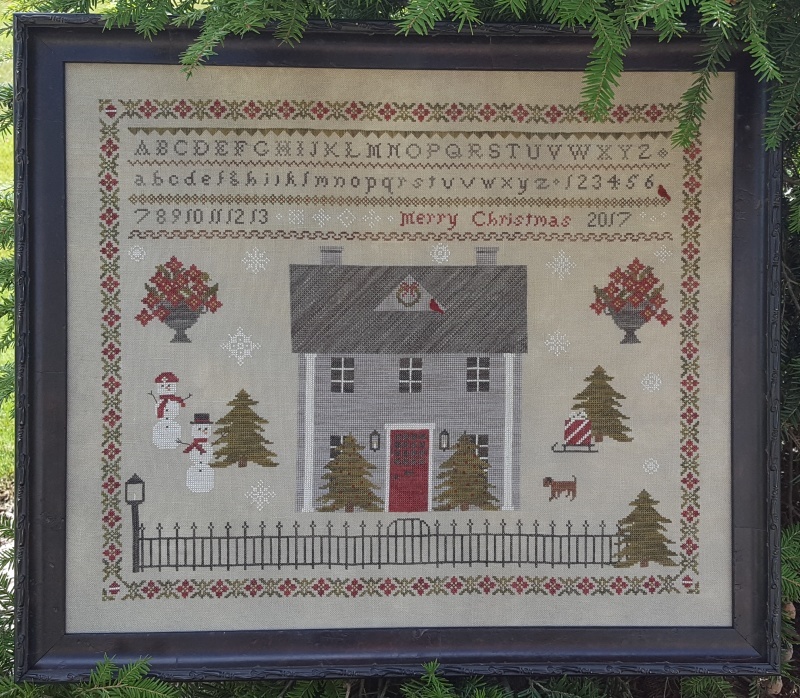 Third in the series of samplers with lots of fun stitches. 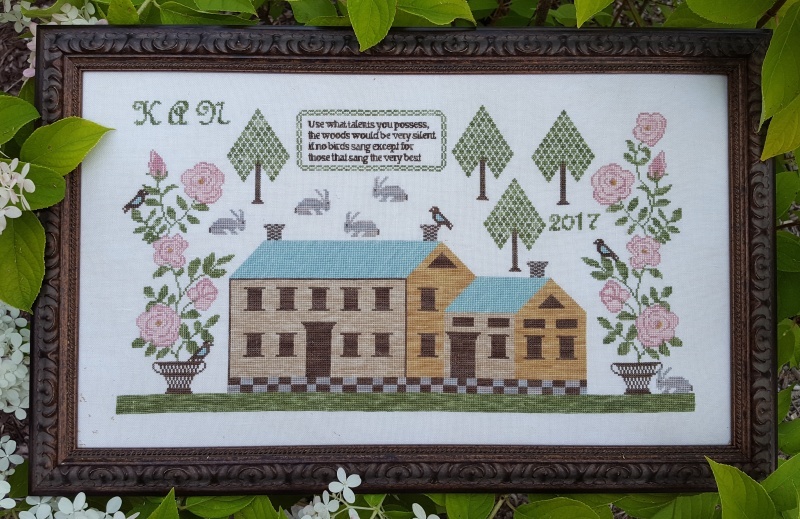 to sit still and watch the leaves turn"
Second in the series of samplers with lots of fun stitches to enjoy! 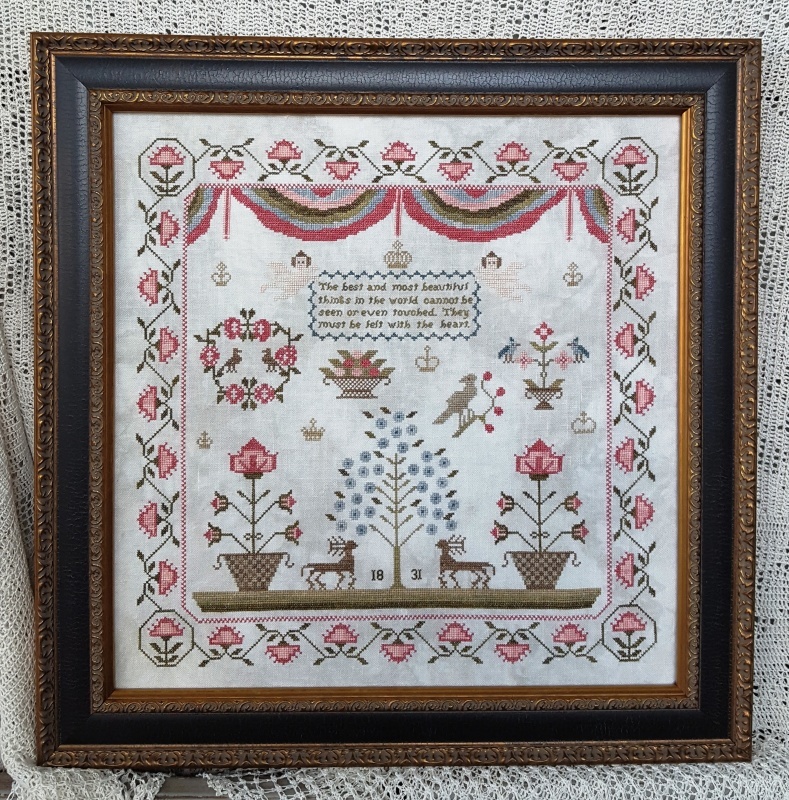 first in the series of samplers with lots of fun stitches to enjoy! I wonder what will next be there"